Every day, Watch This offers staff recommendations inspired by a new movie coming out that week. This week: The release of George Clooney’s The Monuments Men has us fondly recalling other movies about groups, teams, squads, and merry collectives. Like Wet Hot American Summer, Mystery Team finds a comedy group moving into movies by spoofing something relatively specific and borderline arcane to modern audiences—in this case, child-prodigy detective fiction like the Hardy Boys and Encyclopedia Brown. 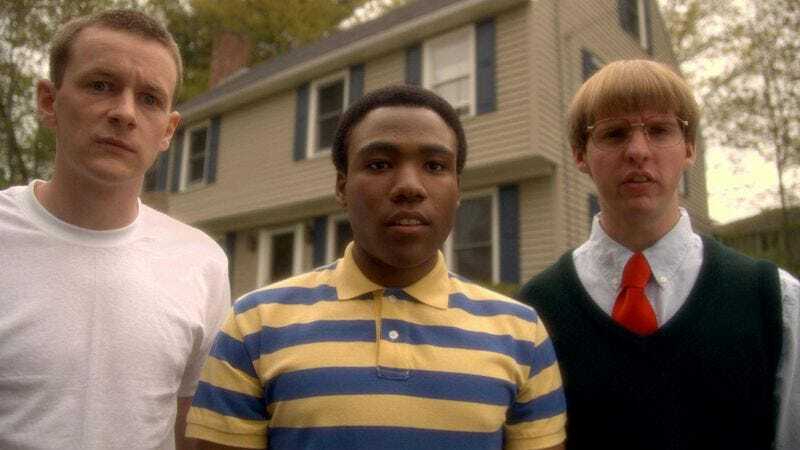 Donald Glover, D.C. Pierson, and Dominic Dierkes, of the Internet sketch team Derrick Comedy, play a trio of teenage sleuths, about to finish high school but still stuck in the glory days of walkie-talkies, missing baseballs, and pies stolen from windowsills. When a little girl approaches them about solving the murder of her parents, they decide to step up and prove their worth as real detectives. While the film concentrates on mixing wholesome small-town attitudes with hilariously grimy small-time sleaze (strip clubs in the daytime; drug dealers with crummy vans), it also works as a parody of caper movies in which each team member has a special skill. Glover is the enthusiastic leader; Pierson plays the “smartest kid in town” whose knowledge comes almost exclusively from a single book of wacky facts aimed at children; and Dierkes acts as the group’s muscle, who must have been strong for a 10-year-old but now seems, if anything, like maybe the physically weakest of the bunch. These sound like easy jokes, but while the heroes don’t have many skills to offer, the actors who play them—and who co-wrote the screenplay with director Dan Eckman—contribute a great deal as comic performers. All three nail the specificities of their cartoonish characters, as well as the core of sadness behind three almost-men so in love with their childhood triumphs. The teamwork vibe extends throughout the production, which feels like a labor of love. Even back in 2009, Donald Glover was by far the most famous member of Derrick, thanks to his writing on 30 Rock and the music he performed as Childish Gambino. (Community wouldn’t premiere until September of that year, just a couple weeks after the film’s very limited theatrical release.) But while Glover is the nominal lead of Mystery Team, the movie doesn’t turn into a lopsided showcase; all three actors get plenty to do, and receive strong support from comedy ringers like Aubrey Plaza, Ellie Kemper, Bobby Moynihan, and Matt Walsh. Beyond its irresistible premise and comedy-team ethic, the movie is just extremely funny. Though low budget and woefully underseen, it’s one of the best recent translations of sketch-comedy sensibility into a big-screen narrative. Availability: Mystery Team is available on DVD (which is can be obtained through Netflix), to rent or purchase through the major digital services, and to stream on Hulu Plus.